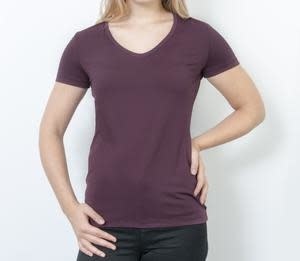 This beautiful v-neck t-shirt in our unique, smooth microfiber is soft and wonderful to wear all day. For a feminine look, style with a beautiful necklace, and wear with black pants and heels. Or wear with jeans and sneakers for a cool day look. Extremely durable material -you can wash it over and over, while the fit and color stays the same. The smooth surface makes it perfect to wear as underwear, or as a layering piece, because the surface allows anything you wear over, to flow beautifully over without creasing. Can be worn to any occasion or activity. Works very well as a sports top for an active living, running, yoga, gym etc. The fashionalble design also makes the top perfect for styling your chic everyday looks.